Somnio so very generously sent me a pair of their AMAZING shoes for free to review on my blog. I love them! Somnio's shoes are very customized to suit your every need. They shoes retail from between $130-160. Part of the customization includes includes three types of footbed options, cushion inserts with differing densities for the heel and forefoot areas, and varus wedge inserts made to help align the foot and lower leg. Arch comfort, leg alignment, cushioning, foot strike, and pronation control are all things that are of focus when building these shoes. All of these things can help comfort and prevent injury. You can go to a Somnio store or choose your shoes online. There are very helpful and easy to use videos to assist in building your perfect shoe. The shoes that I needed were the Women's Runaissance shoe which is a neutral shoe in regards to pronation and for people with medium to high arches. Also, I got to choose the kind of cushion that went into the shoes based on my weight. I chose the 2 varus for each foot based on the way that my knee bends. And also got to choose the arch footbed (mine was a high arch). My Opinion: I LOVE THESE SHOES! I loved being able to customize them and make them perfect for my needs. They fit so well and actually feel like they are made for my foot. My husband came home from work the other night and saw my new shoes and was like "Those are some awesome shoes". Then the next day he said "Did I tell you I love your new shoes?". Haha. Anyways, I would highly recommend these to any runner or person who likes to exercise. My siblings are both cross country and track runners and I will tell them about these shoes to tell their teammates about them. Thank you so much Somnio!!! 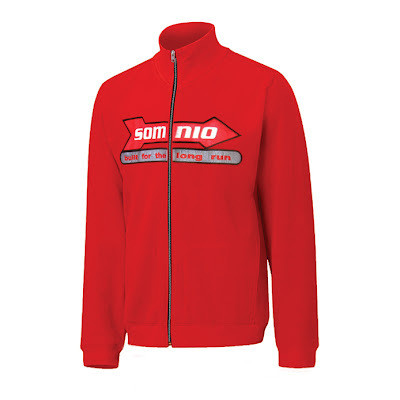 The giveaway will be for one of these awesome Somnio Running Jackets (as seen in this picture)! This is a $70 value!!!! The giveaway is open until Midnight on Tuesday September 21th. Winner will be chosen on Wednesday September 22st using Random.org. Visit the Somnio website and tell me one thing that you learned! I learned that Somnio is latin for dream. I have my Balance NIke shoes for running. Hope I win that jacket....so perfect for running! we recycle :), conserve water as much as possible too! I learned that somnio is extra ordinary shoe because they try to build perfect shoe that pain free for us, and i just learned that somnio means "dream" in latin language, i'll note that down,lol. I just subscribed to ur blog. I turn off the lights when i leave my room, even for a short time. I unplug seldom used appliances. I learned that Somnio is founded on the principle that shoes should adapt to the individual, which is very cool & makes so much sense! My only pair of running shoes are from Walmart that I got 5 years ago - sad huh? I don't even know what brand they are, but I know they were cheap, lol. I help the environment by reusing bottles and drinking from the tap. I use a microwave whenever i can instead of a conventional oven or stove. I water plants in the afternoon. i'm into adidas brand running shoe too. I learned that Somnio gets the seal of approval from Prevention magazine. I recycle daily. It is just a daily thing, like brushing your teeth. I forget how I found you now. I been around for awhile. I buy any shoe that fits good and has a good price. Found you on Spotlight saturday, and I always thought I should have been a nutritionist...maybe someday :). Therefore, I am following your blog, your "about me" sounded so interesting. And congrats on being a newlywed. That is such an exciting time period, the newness of life together! Ummm....OK.....I had never heard of this brand! I love the idea of customizable foot beds. We are holding on to two "tube" TVs until next month when we can take them to a recycling center in our county to keep them out of the landfill! I learned that the company uses The Line Up Measuring Device to make a perfect fit!! I subscribe to your blog via GFC! I help save the environment by washing ALL of my clothes in cold water to reduce Carbon output. I found your site through Giveaway Scout a long time ago! My usual 'Go To' running shoes are Puma's! I found your site when you left a comment on my running blog. I clean or replace air filters on my air conditioning unit at least once a month to save environment. I set my freezer at 0 to 5 to save environment. I plant trees to shade my house and as I love flowers, I plant some flowers too like jasmine and rose... looks beautiful! Go green! I copy and print on both sides of paper in the office. I sometimes use recycled paper. In my country, it's a trend now to shop with a canvas bag instead of a paper and plastic bags. The groceries store even sell the bag, buy once and when it's broken, we can get a new one without pay again. I dont use animal tested make up products. I entered ur just argan natural oil giveaway. entered ur Lia sophia earrings giveaway. entered ur Sunland Peanut Butter! Prevention Magazine is endorsing the shoes - cool! I added this giveaway to the sidebar on my blog. Hey! I'm a new follower great shoes! Please stop back to my blog and follow along. No more water bottles! Reusable bags. I entered the giveaway for the waterbottle. Somino means dreams in Latin. They also believe in creating a shoe for each individual person. Great concept! Awesome giveaway! I learned that Somnio is Latin for “dream" and the company's mission is to support individuals in their goals and dreams by remaining pain and injury free! I learned about all the different customizations they have inside the shoes, amazing! You are in my blog roll! I found your blog through blogger! Right now my brand for running shoes is Asics Gel. I don't use plastic bottles anymore for water! Really like their 5-Step Fit Process. I learned about Somnio gait software for fitting shoes... very cool. I use my reusable bags when I go shopping. My running shoes right now are the asics gel. I actually got fitted for some Somnio shoes. I learned a lot from the process. I learned that just because you are overweight, doesn't mean you need a lot more cushion or support necessarily. We recycle plastic from milk. I use a reusable water bottle most of the time. I found your site from your GU giveaway. Been following since! I learned that Somnio is Latin for “dream.” and that Somnio is headquartered in the coastal community of La Selva Beach. To help the environment I like to use baking soda, borax and vinegar to clean surfaces instead of store-bought cleaners, recycle, use reusable shopping bags. Go to brand of running shoes is Adidas! I originally found your site through Tightwad in Utah. I learned about this giveaway from your emails. I visited the websites and learned just how easy it is to customize these shoes to fit your fitness needs and foot type. I stumbled onto your website through another one called craftaholics anonymous..